Gothic Tropic’s Headlinging Punk Performance at San Diego’s Lantern Street Festival Rocked and Banged the Night Away. It’s a cool 70 degrees at approximately 5:35 p.m. The sun is shining down on San Diego’s Lantern Street Festival at Liberty Station headlined by Los Angeles band Gothic Tropic. Opening act Pretty Polly gracefully takes the stage, kicking off the evening as festival attendees are checked-in and given their lanterns. An all ages event, the festival is home to dozens of food stands with lantern decorating station taking over the back of the courtyard. The show has only just begun. 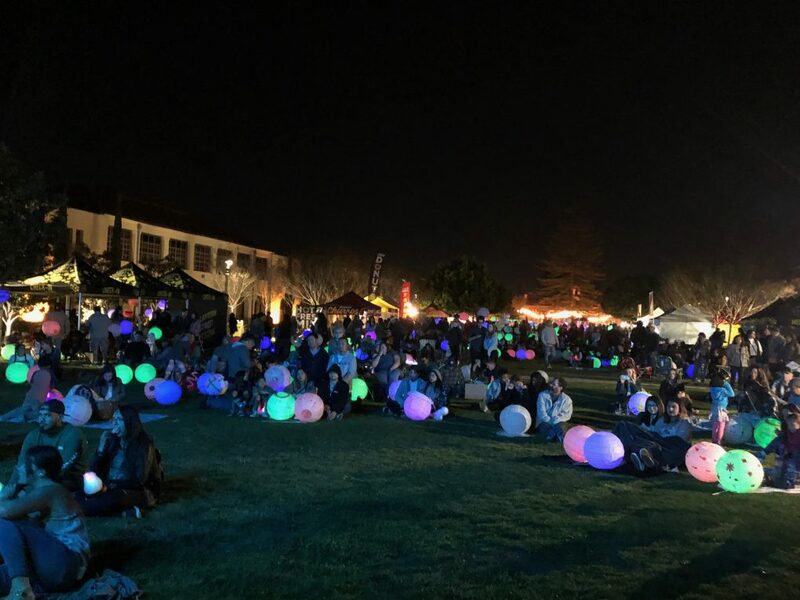 As a crowd of over 5,000 cycled in throughout the cool evening, opening performances by Pretty Polly and BELLSAINT warmed up crowds who were already filled up with delicious food. The time is now 8:30 p.m., Gothic Tropic is slated to take the stage in a few moments. This is their first headline performance, ever. Which begs the question, who is Gothic Tropic? Gothic Tropic is the indie pop band of Southern California you’ve never encountered. It is the creation of multi-instrumentalist, vocalist, and Los Angeles native Cecilia Della Peruti. Della Peruti was recently chosen by Fender for their American Series Campaign, exemplifying the power she holds when a guitar is in her hands. Similar to what Prince’s band The Revolution was first known for, a guitar is a vessel for Della Peruti to express herself while putting a focus on the music instead of the artist. But despite this, she still stays true to her methods. Humility, consistency, and transparency are the tools driving Della Peruti and Gothic Tropic to the top, at their own pace. Fans are anticipating their next album, expected sometime before summer, and Della Peruti is as excited as the fans. “I’m really excited! I’m just so stoked.” said Gothic Tropic’s leading lady. She is also working on a collaborative project called “Bloodthirsty” with Italian Composer Daniele Luppi and writer/producer Alex Goose. proudly declared by Della Peruti. It’s now nine o’clock at the Lantern Street Festival. Gothic Tropic was supposed to be onstage 30 minutes ago. Unfortunately, technical difficulties have been frustrating the band and the crew for the last hour. Eager to play, Della Peruti does a lap around the stage after showing a bit of frustration. The backing tracks are not coming through, making it difficult for the band to perform new songs, let alone any at all. The tracks are not coming in anytime soon. “We’re a punk band tonight!” exclaimed Della Peruti as she ran on stage, signaling the band behind her. The crowd has been ignorant to the technical difficulties up to this point; Soon, Peruti takes control of the crowd’s attention. “We’re Gothic Tropic, tonight it’s a punk show and we’re gonna play a new song called drunk on a rhythm.” Della Peruti shouted into the mic. Peruti’s exhilarating almost 3-minute guitar solo left the crowd cheering and Gothic Tropic’s frontwoman with nothing else to give the audience but a wave goodnight. This year marked the first ever 88Rising Music Festival: “Head in the Clouds.” More importantly, this was the very first Asian-American music festival in North America. With an attendance of 2,500 or so, 88Rising does not rival the big dogs such as Coachella or Lollapalooza, whose attendance is in the hundreds of thousands. However, this is not to say that the touring festival was not filled with an equal amount of passion. It was held at the Los Angeles State Historic Park, a fitting location considering the festival is a major milestone for Asian-Americans. 88Rising is a mass media company that covers all aspects of a musician’s life, from management and production to everything in between. By representing artists such as Rich Brian, Keith Ape, Higher Brothers, Joji, and more 88Rising is becoming more known and respected in the music industry. It is a one of a kind company that truly aims to support Asian artists and underrepresented people in music. In addition to their star-studded lineup, 88Rising brought out Anderson .Paak and MadeinTYO and had them perform some of their own original songs. L.A. natives DUCKWRTH and Dumbfoundead represented their city and introduced their fellow artists to their hometown (several of them had never been to Los Angeles). Nonetheless, all the artists had undeniable chemistry with one another. The festival itself is very organized – especially considering it is the first of its kind. There were the usual merchandise booths, eateries, and a second stage with local DJ’s dipping their toes into the pool of live performance. This festival was the very first stop on their tour across the nation, and hopefully the first of many more tours to come. A company with as much ambition and passion as 88Rising will grow exponentially as they add more and more artists to their unique label.